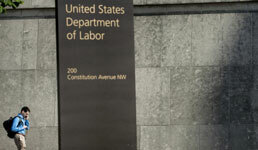 The full implementation of the Department of Labor’s fiduciary rule has been delayed but that doesn’t mean the confusion about what retirement advisors need to do to comply has abated. Dennis Concilla, Columbus, Ohio-based head of Carlile, Patchen & Murphy’s securities litigation and regulation practice group, says he still gets calls from clients and prospects asking for guidance on how best to address the DOL rule during the transition period. He says those callers are telling him they're “experiencing confusion” because they've been receiving different – and sometimes conflicting – advice from various lawyers. Until the DOL rule is fully implemented on July 1, 2019 – barring any changes to that date following a DOL review of the rule – retirement advisors are working on compliance requirements for the transition period. Among other things, the so-called fiduciary rule requires advisors to inform investors of any potential conflicts of interest and have their clients sign a Best Interest Contract Exemption document if the advisors receive variable compensation for providing retirement advice. 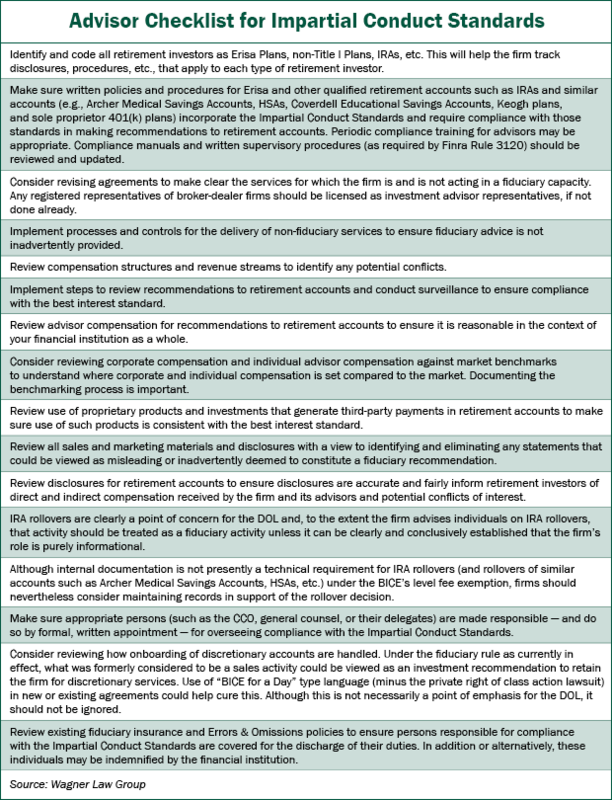 But during the transition period, retirement advisors who expect to make use of the BICE are required to comply only with so-called Impartial Conduct Standards, which state that BICE users must “adhere to basic fiduciary norms and standards of fair dealing.” Specifically, advisors must charge no more than reasonable compensation, avoid making materially misleading statements, and must provide advice that is in the investor’s best interest. In an email sent to clients and other stakeholders, the Wagner Law Group says the ICS are “somewhat more vague and do not necessarily lend themselves to easy compliance checklists.” As such, the law firm has released a checklist of steps advisors can take to “protect themselves and demonstrate compliance” to the ICS. The law firm expects the DOL, IRS and SEC to continue to share audit information and make cross-referrals under existing inter-departmental protocols. Regardless of the stated enforcement position of any of these regulatory bodies, a “demonstrated effort” to meet the ICS will be a “powerful factor” in determining compliance, the law firm says. “The presence of well-documented client files, formally adopted processes and procedures, evidence of attempts to adhere to such processes and procedures, and internal compliance training will be among the most impactful factors to demonstrate efforts to comply” with the ICS, the law firm says. There are 16 items on the checklist but the Wagner Law Group firm nevertheless describes it as non-exhaustive. “Although no single step” in the checklist “is required by law or regulation, we think it is important for financial advisors and institutions to take some steps to implement and enforce” the ICS, the law firm says. The first five items of the checklist are: Identify and code all retirement investors into their proper categories; ensure written policies and procedures for Erisa and other qualified retirement accounts incorporate ICS and require compliance with those standards; consider revising agreements to make clear the services for which the firm is and is not acting in a fiduciary capacity; implement processes and controls for the delivery of non-fiduciary services to ensure fiduciary advice is not inadvertently provided; and review compensation structures and revenue streams to identify any potential conflicts. The complete checklist from the Wagner Law Group is available at the bottom of this article. RIAs generally have less to do compared with broker-dealers to comply with the ICS since RIAs have been acting as fiduciaries even before the DOL rule while broker-dealers were held to suitability standards. He says Edelman “didn’t have to start from scratch” to comply with the DOL rule since it charges clients a flat fee instead of a commission. What Edelman has done to comply with the DOL rule, as it stands, is to “make a couple of enhancements to our documentation policies and conduct some training for our client service folks and our financial planners, to make sure they are attuned to the specifics of the rule,” he says. When asked to cite an example of changes Edelman has made, Parker says the company’s advisors have always talked to their clients about the “key factors,” such as where their IRA or 401(k) accounts are invested, what investment products they are holding, and the fees they have been charged. “These enhancements are pretty invisible to the client but they are more to make sure we are standardized in our workflow,” he says. Meanwhile, Deloitte estimates broker-dealer firms and firms dually registered as broker-dealers and RIAs have already spent more than $4.7 billion in preparation for the rule’s June 9, 2017 partial applicability date and will be spending more than $700 million annually to maintain compliance. John Ellis, a New Orleans, La.-based senior retirement plan consultant at UBS Financial Services, insists that although UBS is a broker-dealer firm, its advisors have been acting as fiduciaries and acknowledge that role in writing. He doesn’t expect his practice to spend a significant amount to comply with the DOL rule going forward. He says investment decisions and strategies are also documented and delivered to clients, whom he meets with quarterly, as part of his client engagement process. “We have a tangible story that shows why decisions were made,” he says.